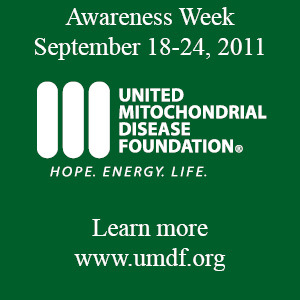 Today marks the first day of Mitochondrial Disease Awareness Week!!! If Ana has ever made you laugh, cry, think, or pray, then change your facebook profile picture to the one in this post. Keep this profile picture from September 18th through September 24th! Lets see if we can turn facebook green! On Monday, I plan to show Ana her group member list and my friend list. I pray they are all green and she can see how much you all care about finding a cure. People assume mitochondrial disease is rare, but it is not! Kids are not the only ones affected! Please visit www.UMDF.org to learn about other ways to advocate for Ana Maria. The UMDF website will even assist you in sending a letter to your state representatives! 1) Right click on the picture above and save it to your computer. 2) Log in to your facebook profile and click on your profile picture to change it. 3) Click the upload tab and upload the picture to your profile. 4) Leave it up from September 18th to September 24th!